First I want to give a shout out: I’m so grateful for Dr. Scanlon, and her amazing research in the field of teaching that she was able to connect me to the Two Writing Teachers writing community – Thanks Dr. Scanlon! Now that summer is here I have time to write, and want to share my writing and explorations on a writing community such as Slice of Life. Summer is a great time for teachers to relax and reflect on the past school year, and while I’m relaxed with less stress on my plate I’m still pretty busy. Now is the time for me to keep researching great teaching tools, lesson plans, books to share, ideas, as well as participate in professional development that is fun! This summer I’m heading to the Clarice Smith National Teacher Institute hosted by the Smithsonian Museum of Art in Washington D.C! I’m super excited about it, and know I will learn a great deal about using art in the English Language Arts classroom. I think the major reason visual art is such a powerful teaching tool is because the majority of students are visual learners. Using art allows all students to get involved especially ELLs who have a limited vocabulary, but can connect with material through viewing art and making art. I want to blog about teaching more so than my personal life, but the daily Slice of Life in March was more of an experiment in initially writing everyday, and was a break from my constant thoughts about teaching during a swamped month of work and graduate work. I’m thinking of adding pages to this blog about teaching specifically, or perhaps create a completely separate blog just about my teaching experiences, ideas, book shares, and lesson plans? 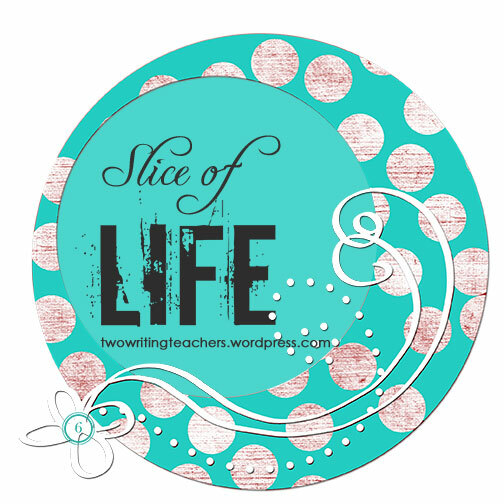 The reason for adding pages to this blog is because on Slice of Life I get some sort of exposure – whereas a new blog about just teaching I don’t know of a community to share it on that generates readers and comments like Slice of Life. While researching I have found two websites that have a community of conversation and sharing teaching ideas: English Companion on Ning created by Jim Burke, and Learnist which is like a Pinterest, which can focus on teaching and education specifically. July 8-12 Clarice Smith National Teacher Institute! Where did my 27, 28, 29, 30, & 31 posts go? Well to be honest I became so swamped with deadlines for my Masters, work, and life that I physically was unable to write and post on those last few days of the writing challenge. Update on my Masters: I graduated!! I finished my last semester with all A’s, and I’m now the happy owner of a shiny new MA degree in Teaching English Language Arts. I loved the Slice of Life Challenge and hope to start participating in the Tuesday (weekly) SOL. For my last Gardening Tuesday post I’m going to write about the herbs I currently keep in my garden and what I do with them. There are all kinds of herbs out there – all of them have healing properties! Isn’t that amazing?! I believe plants have the cure to many diseases, and for thousands of years humankind used herbs to heal themselves. Due to the amount of time humankind has spent looking at herbs and other plants to heal us there are old folklores attached to some plants, and I find the histories of each plant that I come across fascinating. The folklore and medicinal uses I list are cross referenced from a variety of texts on the subject – before considering ingesting any herb for health read all you can about it, ask a herablist in your area and always follow the directions for dosage. Mostly used in my chili after I’ve dried it, as the fresh herb is very hot and spicy. I dry the leaves whole and only crush when I add to the chili or an Italian sauce I’m making. Folklore: Oregano is a plant of joy – you plant this near the grave of someone you love as it banishes sadness and brings peace and joy. I cook with basil – always fresh and bake it into the dish, or the sauce. Mostly used when I prepare Italian dishes, but add it to salads too. Folklore: Basil has so much history throughout the world there is a whole bunch of folklore ranging from a herb of love to a protection herb. Grown mostly for its smell in my garden, but also I make a peppermint oil for baths and feet. This peppermint is too strong to cook with, but have added sprigs to drinks. Folklore: Companion plant – plant near other plants as a bug repellent. Not just for fresh breath, peppermint when chewed fresh is meant to relieve toothache! Grown for my cat who likes to eat it fresh off the plant, but I dry the surplus and make cat toys filled with the dried herb. I also give surplus catnip to a friend. Folklore: Seeing plant – used by cats, but can heal as a prepared tea for humans as a sleep aid, and contains vitamins C and E.
I mostly use parsley fresh on potatoes, salads, and for other garnishing. I use it when I make my stock from the bones of a chicken or turkey, and my mum also uses my parsley to make a parsley cream sauce for fish dishes and pies. Folklore: Plant of rebirth, known to help with many ailments from rheumatism to kidney problems. Like peppermint, parsley is a great companion plant and can ward away bugs from beloved tomato plants! It’s my spring break this week, so I’m down on the west coast of Florida living it up for a week of sunshine, museums, food, reading, and relaxation! Life is very good right now! For this cooking Monday post I’m going to write about two of my favorite seafood dishes at the moment. I love all kinds of seafood dishes, but for the sake of this post I’m just going to keep it to two. Top with sour cream or guacamole, or both! A love poem – this is the most revised poem I’ve written. the last Abbot of Reading. night, and watch the silent rain. This poem is about the cat I cared for before Mumphrey. I was also taking a T.S. Eliot grad class at SFSU and was reading Allen Ginsberg a lot when I wrote it. drank from the waters of Lethe. My Little Slices of Life!